Though they were often teased in the lead up to production, it has been officially revealed that neither Breaking Bad characters Walt nor Jesse will be making an appearance on the first season of Better Call Saul. Creators of the spinoff Vince Gilligan and Peter Gould used their appearance at this weekend's TCA's press tour to clear up some of the misconceptions about their new series, which debuts February 8. "In the spirit of full disclosure, Walt and Jesse will not appear in season one. Having said that, everything else is on the table." "The short answer is: The sky is the limit and any of these characters could conceivably show up in future seasons. But the intention is it will feel proper and organic, because if it feels like a stunt then something has gone terribly wrong in the writers' room. Jesse will be tricky, because he's so young [during the Better Call Saul timeline]. To be completely honest, I want to see them all eventually. There's a constant tension of, 'Man, this would be fun to do, but would it just be a stunt?'" 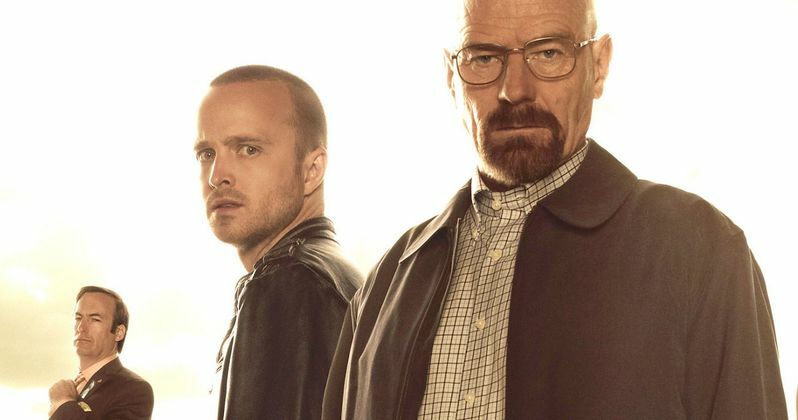 Related: Bryan Cranston Confirms Breaking Bad Movie, Will Walter White Return? "Breaking Bad had a hand-held camera, it always had a little bit of motion to it. This time camera always tends to be static and locked down. It almost feels like [Saul] is struggling against the corners of the frame."